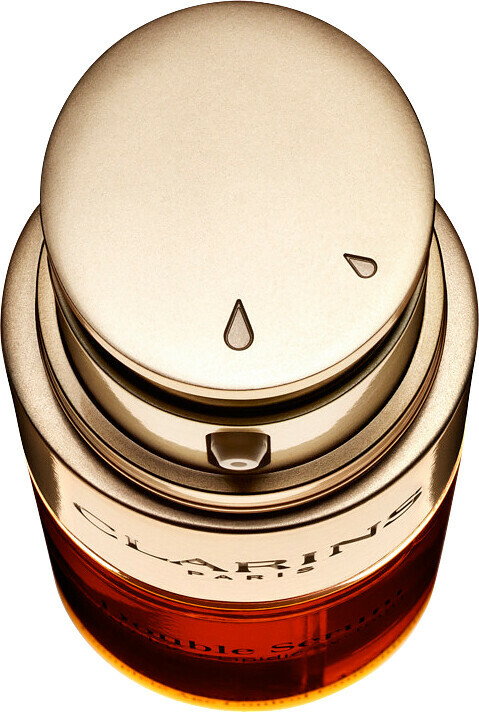 Suitable for all skin types, the Clarins Double Serum Complete Age Control Concentrate contains 21 active plant ingredients which work to intensely boost hydration, radiance and collagen production, while fighting the effects of ageing, stress and pollution. Infused with a multitude of botanicals to keep your skin looking youthful and fresh, added turmeric protects your skin from oxidative stress, whilst improving communication between cells for a healthy, radiant finish. 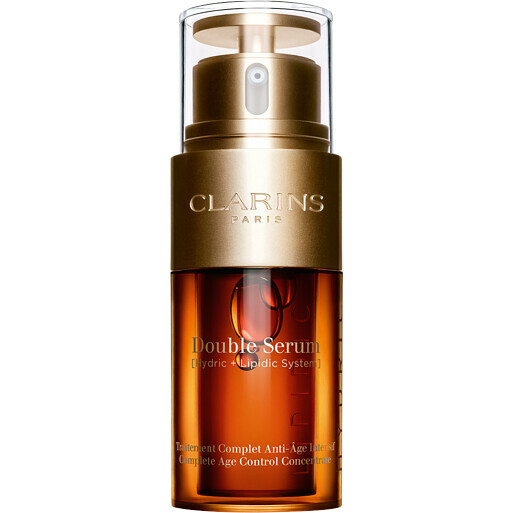 Created with almost 30 years of anti-ageing research and expertise, the Double Serum harnesses the twofold power of hydric (water-soluble) and lipidic (oil-soluble) phases in two separate pump dispensers, which are mixed only when applied. This ensures maximum concentration of the best skincare ingredients, delivered directly to the skin. Fitted with an adjustable product dispenser that caters to the needs of skin types and climates, you can measure your Double Serum dosage with its rotating push button. AQUA/WATER/EAU. CETEARYL ISONONANOATE. GLYCERIN. ISONONYL ISONONANOATE. CAPRYLIC/CAPRIC TRIGLYCERIDE. PENTYLENE GLYCOL. PPG-3 MYRISTYL ETHER. ETHYLENE/PROPYLENE/STYRENE COPOLYMER. DIPSACUS SYLVESTRIS EXTRACT. BUTYLENE GLYCOL. PARFUM/FRAGRANCE. PHENOXYETHANOL. PROPANEDIOL. TROMETHAMINE. SILYBUM MARIANUM SEED OIL. CARBOMER. TOCOPHERYL ACETATE. ESCIN. CHENOPODIUM QUINOA SEED EXTRACT. ETHYLHEXYLGLYCERIN. SQUALANE. AVENA SATIVA (OAT) KERNEL EXTRACT. THEOBROMA CACAO (COCOA) EXTRACT. BUTYLENE/ETHYLENE/STYRENE COPOLYMER. LEONTOPODIUM ALPINUM EXTRACT. XANTHAN GUM. PERSEA GRATISSIMA (AVOCADO) OIL UNSAPONIFIABLES. CARAMEL. CURCUMA LONGA (TURMERIC) ROOT EXTRACT. SALICYLOYL PHYTOSPHINGOSINE. MUSA SAPIENTUM (BANANA) FRUIT EXTRACT. SALICORNIA HERBACEA EXTRACT. ACTINIDIA CHINENSIS (KIWI) FRUIT EXTRACT. KALANCHOE PINNATA LEAF EXTRACT. SODIUM BENZOATE. CITRIC ACID. MYROTHAMNUS FLABELLIFOLIA LEAF/STEM EXTRACT. DISODIUM EDTA. TOCOPHEROL. LYCIUM BARBARUM FRUIT EXTRACT. MALTODEXTRIN. ORTHOSIPHON STAMINEUS EXTRACT. HEDYCHIUM CORONARIUM ROOT EXTRACT. MANGIFERA INDICA (MANGO) LEAF EXTRACT. POTASSIUM SORBATE. PENTAERYTHRITYL TETRA-DI-T-BUTYL HYDROXYHYDROCINNAMATE. JANIA RUBENS EXTRACT. ASCORBIC ACID. SODIUM CITRATE. ENGELHARDTIA CHRYSOLEPIS LEAF EXTRACT. CI 14700/RED 4. CALLICARPA JAPONICA FRUIT EXTRACT [V2925A]. 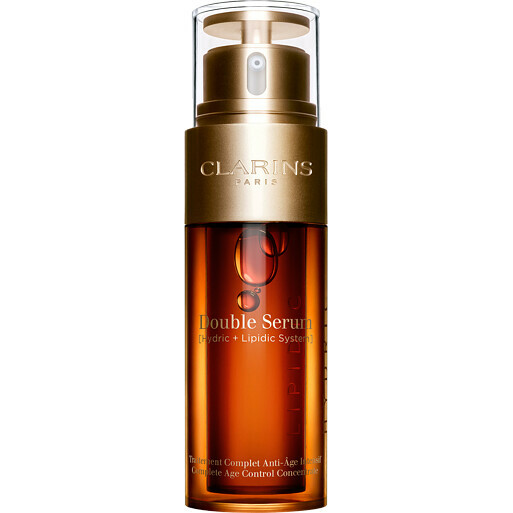 Clarins Double Serum - Complete Age Control Concentrate is rated 4.6 out of 5 by 82. Rated 4 out of 5 by TSKJ from Bought product aa present Fairly priced product with no shipping fee. Product arrived day after purchase though purchase was made after 11pm. Very pleased with the service. Bought product for some one else so can't really make an accurate comment. Rated 5 out of 5 by Wrinkleigh from Love it Love it, love it, love it. What can I say, love it. Rated 5 out of 5 by KK3605 from Great product, Great price - thank you Escentual Love this product and Escentual always has really comepetive prices. Rated 4 out of 5 by Puggy from Feels luxurious Skin feels very comfortable and gives a nice sensation of being moisturised whilst wearing it. Appearance of my skin is more even. I like the choice of how much you would like to be dispensed of the product by turning the cap. My jury is out as to wether it is worth the high cost for the results so far achieved.